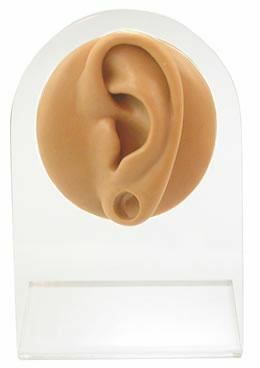 This Tan Silicone Left Ear Body Bit is ideal for displaying a variety of ear jewelry. The silicone body bit measures 1.25" (W) x 2.5" (H) x 0.5” (D) and resembles a small-sized left ear. It has an 8mm stretched hole on the lobe for displaying plug or tunnel ear jewelry.